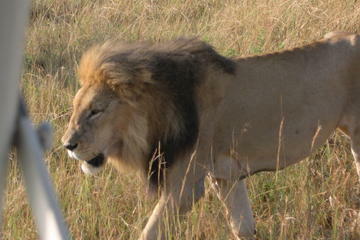 Africa is home to the most spectacular wildlife viewing on the planet. It's a place that humbles even the most jaded of travelers, where the cycle of life plays out right before your eyes in some of nature's most magnificent theaters. See the vast herds of the Great Migration on the mottled plains of the Maasai Mara and the Serengeti. Watch elephants graze in the shadow of Mount Kilimanjaro, or come-face-to-face with a wild silverback gorilla in Volcanoes National Park. Many of the reserves protect Africa's famed "Big Five": lion, leopard, elephant, buffalo, and rhino, as well as an astounding diversity of other animals. Hot air balloon rides, game drives, and walking safaris all offer unique wildlife watching adventures. From Kenya and Tanzania, to Namibia, South Africa, and Botswana, a safari in Africa's top game parks is an unforgettable experience that will forever stir your soul. The magnificent Maasai Mara National Reserve in Kenya is on the wishlist of wildlife lovers around the world. Famous for the Great Migration from July through October, when thousands of wildebeest, Thomson's gazelle, and zebra travel between here and the Serengeti plains, this park offers some of Africa's best wildlife viewing. The park protects the "Big Five," and is known for its large numbers of predators such as lions, cheetahs, and leopards, while hippos and crocs thrive in the Mara River. The red-cloaked Maasai people who live in the park add a fascinating cultural component. In their language, Mara means "mottled," perhaps for the shadows cast by shifting light through the acacia trees on the cloud-streaked horizons, making a hauntingly beautiful canvas for photographers. The name Serengeti conjures romantic images of seemingly endless acacia-dappled plains, golden savanna, and throngs of wildlife, and this World Heritage-listed park, Tanzania's oldest and most popular, delivers on all accounts. From December to July, the Great Migration takes place, when more than a million wildebeest, as well as zebra and Thomson's gazelle, travel between here and the fabled lands of the Maasai Mara, a time-honored pilgrimage that is one of Africa's greatest spectacles. The famed "Big Five" also live within the park's borders, and visitors have the chance to see nail-biting predator-versus-prey battles here - especially during the dry season from June through October. Birders can spot some of the 500-plus species, including beauties such as the crowned crane and Fischer's lovebird. Formerly part of Serengeti National Park, Ngorongoro Conservation Area encompasses three magnificent volcanic craters (Ngorongoro is the most famous), as well as the legendary archeological site of Olduvai Gorge, and more than 8,300 square kilometers of savannah, dense forest, and African bush. This is one of the few areas in the world where wildlife and humans peacefully coexist. The proud Maasai people live alongside a diversity of wildlife within this World Heritage-listed area and graze their cattle on these lands. Besides the spectacular volcanically formed scenery, highlights include one of Africa's densest populations of wild lions as well as black rhinoceros, buffaloes, leopards, wild dogs, cheetahs, and more than 500 species of birds. As part of the Serengeti ecosystem, the area also plays host to the Great Migration as 1.6 million ungulates make their way through here each year between December and June. Mount Kilimanjaro, Africa's highest mountain, presides over this diverse park, which is famous for its large herds of elephants. This is Kenya's second most popular national park after Maasai Mara National Reserve. Five different habitats lie within its borders, including a swamp system, dense woodlands, savannah, and the dried-up bed of Lake Amboseli. Thanks to these contrasting ecosystems, wildlife is varied and abundant with plenty of big cats, such as cheetah and lion, as well as waterbuck, gazelle, impala, and more than 600 species of birds. Elephants bathing in red dust against the dramatic backdrop of Mount Kilimanjaro is one of the iconic images photographers might capture during the dry season at this famous park. Visitors here also have the chance to visit a Maasai village near the park and learn about this fascinating tribe, who live around the park's borders. The largest and oldest national park in South Africa, Kruger National Park spans almost two million hectares and offers an incredible wildlife watching experience - especially for those who are seeking a self-drive safari. Africa's Big Five live within its borders as well as an impressive diversity of other wildlife, including African wild dog, giraffes, zebras, hippos, cheetahs, and more than 500 species of birds. One of the best features of this popular park is the abundance of self-catering accommodation, making this a relatively affordable safari destination. The scenery ranges from dense forests to sweeping grasslands and fertile river systems, and the park is also home to Bushman cave paintings and archaeological sites. In addition to the government-run rest camps within the park, several luxury private game reserves lie along the park's borders. In northeastern Botswana, Chobe National Park boasts the planet's highest concentration of elephants as well as an enviable diversity of wildlife. This is reason enough to visit Botswana's first national park, but it's also a fantastic option for travelers who prefer self-guided safaris. The beautiful Chobe River runs along the park's northern border, and the fertile waters of the Okavango Delta fan out to the south, attracting abundant wildlife. Chobe is home to Africa's "Big Five." Along the lush banks of the Chobe River, large herds of elephant as well as sable antelope and buffaloes come to quench their thirsts. The Savuti Marsh region is known for its predator sightings in the savannah and grasslands, while the Linyanti Marsh is home to the rare red lechwe. Accommodation ranges from bare bones campsites to luxury game lodges, and you can also cruise along the Chobe River in a houseboat. The north-east entry gate lies less than 100 kilometers from Zimbabwe's spectacular Victoria Falls, which makes a fantastic side-trip option after a rewarding safari. Botswana practices a low-density approach to tourism, which limits the number of visitors allowed in the parks and helps preserve these unique ecosystems. Moremi Game Reserve is the only protected area of Botswana's magnificent Okavango Delta, one of the richest and most diverse of all Africa's ecosystems. This vast floodplain fans out across the parched lands of northwestern Botswana supporting a dazzling diversity of wildlife. All the Big Five live within the park's borders, as well as an abundance of other animals such as hippos, giraffe, kudu, leopards, African wild dogs, and more than 400 species of birds. The lush scenery ranges from snaking sapphire channels and pools, to lagoons, grasslands, and dense mopane forests. Moremi is also unique because it is the first reserve in Africa that local people established due to their concerns for the dwindling wildlife. Chobe National Park borders Moremi, and many travelers visit both while in the region. Like Chobe, Moremi is also an excellent destination for self-guided safaris, though it helps to hire the services of a local guide who can use their experience in the bush to track the game. A unique experience in the park is exploring the waterways of the Okavango Delta in a mokoro or traditional dug-out canoe. Encompassing 22,750 square kilometers in Northern Namibia, Etosha National Park offers superb game viewing in a vast, shimmering salt pan. At its outer reaches, the parched earth of the pan gives way to sweeping grasslands and thorn scrub that supports more than 150 species of mammals including lions, zebras, jackals, springbok, hyenas, elephants, and cheetahs, as well as many beautiful birds - flamingos descend on the salt pans in a riot of orange and pink after good rains, when the pan briefly fills. The park is also home to endangered and relatively rare species such as the black rhino, oryx, tsessebe, and the black-faced impala. Game viewing is best during the dry season from June through November, when animals congregate at the few remaining waterholes to quench their thirsts. Etosha also accommodates self-guided safaris with its excellent tourist infrastructure. Photographers will especially love capturing images of wildlife against the stark, silvery landscapes. In eastern Zambia, South Luangwa National Park is home to one of Africa's densest populations of wildlife. The Luangwa River, Africa's most intact major river system, feeds this beautiful national park, which encompasses 9,059 square kilometers, and is the most popular of the three national parks in the vast Luangwa River Valley. The park is famous for its large numbers of leopards, lions, giraffes, buffalo, and elephants as well as its profusion of hippos and crocodiles, which wallow in the oxbow lagoons of the river. Interestingly, South Luangwa National Park is the only place in the world where lions are known to kill hippos. Birding is also excellent here with more than 400 different species to see. The seasons paint the landscapes here in dramatically different hues. The rainy season (November through March), known as the "emerald season," brings lush green growth, while in winter, the landscapes are tinged with rich golds and browns. Game viewing is usually best in these drier months (April through October), when animals gather at the perennial water sources. South Luangwa is also known for its excellent walking safaris. At more than 3.6 million hectares, Kgalagadi Transfrontier Park is one of the planet's largest wilderness areas. The park is a merger of Botswana's Gemsbok National Park and South Africa's Kalahari Gemsbok National Park and is the first national park in Africa to traverse borders. The landscapes here evoke a haunting beauty with their vivid hues. Meerkats scamper across scorched red sands and lions stalk in honey-hued grasslands that seem to stretch on forever under cloudless blue skies. Perhaps most iconic among the park's resourceful wildlife are the beautiful black-maned Kalahari lions, but you can also see gemsbok, meerkats, cheetahs, leopards, and hyenas here, as well as many species of birds, including sociable weavers with their large intricate nests. Thanks to the scant vegetation, it's easier to see and photograph wildlife here than in Africa's more densely forested parks. Comprised of Tsavo West, Tsavo East, and Chyulu Hills National Park, this is the largest park in Kenya and boasts the country's biggest population of elephants. Tsavo West is the most popular of these parks with Ngulia Rhino Sanctuary as well as the croc and hippo-filled Mzima Springs. Chaimu Crater is a great spot to see birds of prey. The dense foliage, especially in the park's northern reaches, makes the wildlife more difficult to spot, but the lush landscapes make a beautiful backdrop for photos. Rock climbing is also a popular activity in the park. 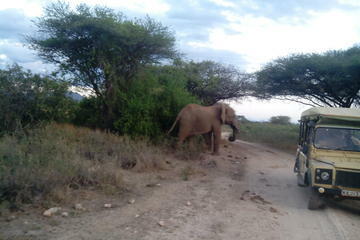 Tsavo East, halfway between Nairobi and Mombasa, is much more arid than its western sibling. Large herds of elephant roll in the red dust here, baobabs dot the parched plains, and the palm-fringed Galana River snakes through the dry landscapes. Other highlights include the world's longest lava flow, the Yatta Plateau; waterfalls; and a diversity of wildlife, including elephants, rhino, lesser kudu, and lions. Chyulu Hills National Park encompasses rolling green hills as well as caves and volcanic cones and craters. It's one of the best places to view Mount Kilimanjaro and offers fantastic birdwatching opportunities. Gazing into the eyes of a mountain gorilla is an experience that will forever remain etched in your memory, and Volcanoes National Park is one of the few places in the world where you can still see these magnificent creatures. In 1967, this is where Dian Fossey, the famous American zoologist established the Karaoke Research Center and continued her passionate gorilla conservation campaign. In addition to mountain gorillas, the park is a sanctuary for spotted hyenas, buffaloes, golden monkeys, elephants, bushbuck, black-fronted duiker as well as more than 170 species of birds. Many travelers also come here to climb the volcanoes, Karisimbi and Mount Bisoke. Volcanoes National Park lies about two hours' drive from Rwanda's capital Kigali.